This is the final delivery of the 2018 summer produce season. 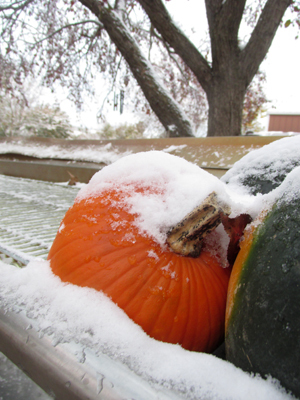 Next Thursday is the first Fall Share delivery – registration remains open here. Please have all remaining boxes, ice packs, egg cartons etc. at the drop site locations by next Thursday, as I will be running my complete summer route one last time. Thyme pairs well with potatoes, carrots, and squashes. Most of these fall crops are great roasted in the oven on high heat. Try the Brussels sprouts halved and sauteed with olive oil, salt & pepper, balsamic, craisins, and walnuts. 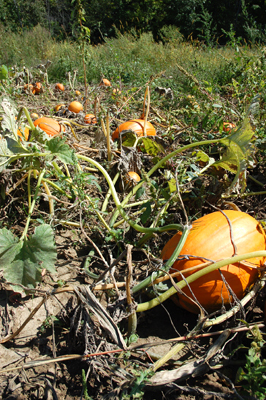 The pie pumpkin can be prepared like a squash, made into a pie or bread, or used as decoration. Please check out our farm article to see our Farm Festival schedule for Saturday, October 27th from 2-8 pm. Wash all of the produce before you eat it. 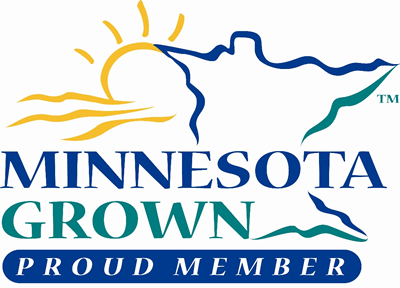 Thank you so much for joining us this growing season!! I see the fundamental pillars of CSA membership is threefold: 1) having access to the freshest, most nutritious produce you can find; 2) supporting local, sustainable agriculture where money remains in the local economy; and 3) bridging that divide between producer and consumer – putting a face to the farmer! 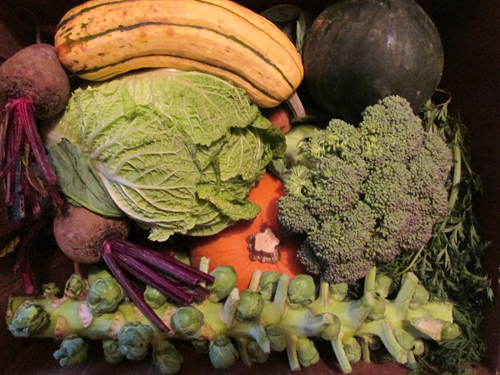 CSA means Community Supported Agriculture. 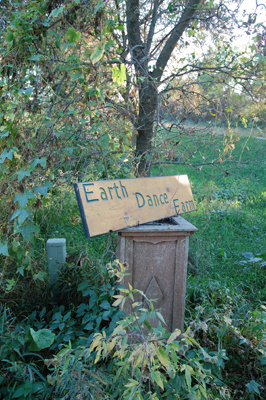 Without you guys as members, we would not be able to farm and sustain Earth Dance Farm! In return, we do our damndest (is that even a word?) to provide you with high quality seasonal produce that is fresh, tasty, and nutritious. We also offer a weekly newsletter to let you know how YOUR farm is doing, have an open door for visits and tours, keep current on Instagram and on Facebook, and always remain just a phone call/email away. Lawn games, bonfire, and farm tours available throughout the party. Chili, apples, carrots, pumpkin bars, and cornbread after 4. Hayride up to the pumpkin patch at 5 and 6. Craft projects available at 4:30 and 5:30. You are free to walk the farm at your leisure and to arrive or depart as your schedule allows. We all look forward to meeting many of you then!!! Brussels sprouts belong to Gemmifera Group of cabbages and are grown for their exotic tasting miniature cabbages. The Brussels sprout has been popular in Brussels, Belgium, and more than likely that is where it acquired its name. Although native to the Mediterranean region with other cabbage species, Brussels sprouts first appeared in northern Europe during the 5th century, later to be cultivated in the 13th century near Brussels. Raw Brussels sprouts are 86% water, 9% carbohydrates, 3% protein, and contain negligible amounts of fat. In a 100 gram serving, they supply high amounts of vitamin C and vitamin K with more moderate amounts of B vitamins. 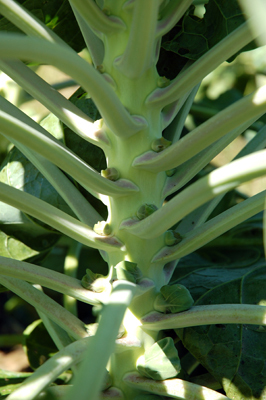 The most common method of preparing Brussels sprouts for cooking begins with cutting the buds off the stalk. Any surplus stem is cut away, and any loose surface leaves are peeled and discarded. Once cut and cleaned, the buds can be cooked by boiling, steaming, stir frying, grilling, slow cooking, or roasting. To ensure even cooking throughout, buds of a similar size are usually chosen. Some cooks choose to make a single cut or cross in the center of the stem to help with the penetration of heat.